NB: this summary does not take the place of a thorough training in, and understanding of, the Social Model across your organisation. The Social Model of disability is an invaluable tool for policy, planning and practice. 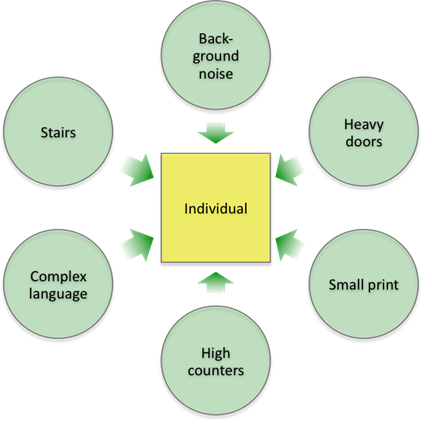 It shifts the focus from the disabled individual to the environment which has obstacles within it. It is these obstacles that disable people, not their medical conditions. This is a powerful tool since it shifts the focus onto things that organisations can control. You have no influence over a disabled person’s medical conditions but you can ensure that the environment you design, create, maintain and are a part of does not have obstacles that disable people. It also shifts the focus away from medical conditions, which you may well not have any knowledge or experience of and onto the environment you work in, which you do have expertise in. Within the social model, your job is to identify the obstacles in our environment and remove them. 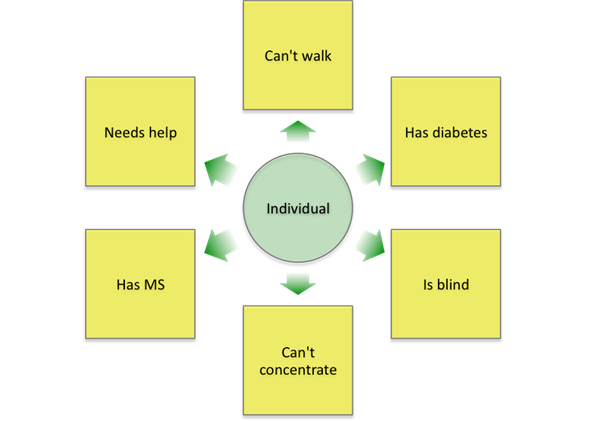 You cannot do anything about the things in the yellow squares in the medical model diagram, but you can change the environmental features in the green circles in the social model diagram.